I know spring isn't for almost a month, but someone should clue in Mother Nature. Yesterday was sunny and a high near 70, so us Ellis' officially have spring fever! Tristan even told me he was going fishing, hehe! Tyler and I, along with my mom and dad, took Tristan to the park. Tyler pulled him around in his wagon, which he loves. 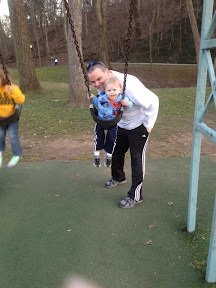 Afterward, we took him over to the swings. He swung (is that the right word?) forever, and didn't want to leave. We bribed him by telling him we were going to dinner. We headed over to Gino's which is right by the park. He has finally gotten to where he can drink from a big straw without a major mess. He doesn't like pop (hallelujah!) and picks water every time. I never give him pop, but my dad tries. 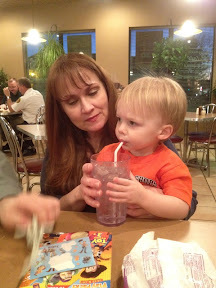 I'm thrilled that he is all about the water, especially since I am addicted to Pepsi!